Acquisitions and Collection Development in the Humanities is a one-of-a-kind guide on the procedures, approaches, and principles needed to make sound decisions in acquiring materials in various areas of the humanities. It gives you an inside look at managerial concerns in documentary delivery, changing budgetary needs, and fluctuations in journal prices and helps you address many of the important questions in acquisitions and collection development within both traditional and technological environments. 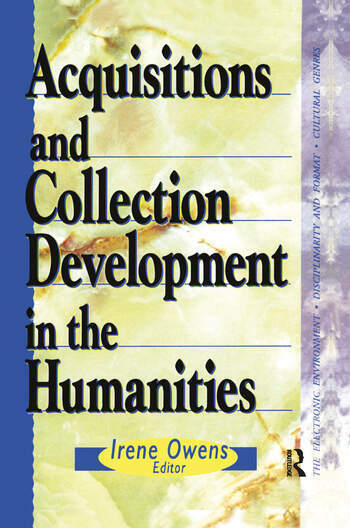 Acquisitions and Collection Development in the Humanities can help professional librarians, graduate school faculty, and students in information and library science acquire the knowledge and skills necessary for building a broadly based and academically responsive collection. It will certainly help you keep up with changes in the information environment and show you how the tools you’ve developed for selecting traditional library materials will be useful as you grapple with electronic texts, “spider” search mechanisms on the Web, becoming a webliographer, and budget shortfalls.